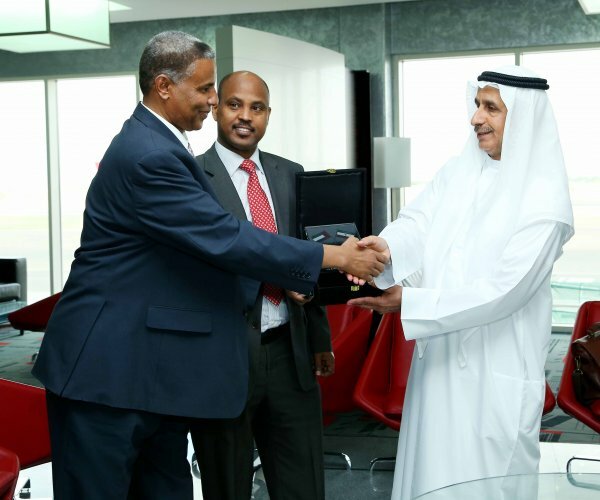 Somaliland government representatives recently concluded a major deal with the United Arab Emirates (UAE) owned Al Arabiya Airline in Dubai. On the occasion of the signing ceremony, Somaliland Minister of Commerce and International Investment stated that any individual or business entity interested in investing in the country is welcome to do so. The Minister of Civil Aviation and Air Transport Hon Mahmoud Hashi Abdi and the Minister of Commerce and International Investment Dr. Mohamed Abdullah Omer have during a working trip to the UAE concluded a major deal with the UAE owned Al Arabiya Airline in Dubai. The two Somaliland Ministers signed the deal on behalf of the government of Somaliland with high ranking officials from Al Arabiya at the Airlines headquarters in Dubai in a deal which will also pave the way for the airline to use the facilities of airports in Somaliland. Apart from Al Arabiya Airlines which is expected to begin operations in the coming weeks, the only other international carrier which operates flights to Somaliland is Ethiopian Airlines, with Kenyan Airways expected to join the rest in the coming future.